I am so excited to show you these beautiful gifts! We've used a collection of paper that has creams, browns, and blues combined with glitter to make these a very eye catching gift for such a special season. One of the quotes we really liked says, "Every sister who lives as a woman of God becomes a Beacon for others to follow..." (Elder M. Russell Ballard) - so we've created a beautiful bookmark that is included in each gift. A picture of the Mt. Timpanogas Temple was used for the bookmark (and was taken by a local photographer, Nate Ekins) and is exclusive to Pioneer Party. 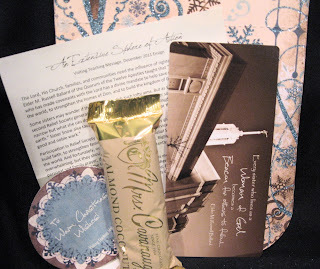 Also included in the gift pouch is the full message from the Ensign, printed on cream paper, and a Mrs. Cavanaughs gourmet candybar. The chocolates are (seriously) delicious! You will receive one of three different kinds: a white chocolate almond coconut, a dark chocolate roasted almond, and a milk chocolate caramel bar.